Writing a blog post -like all other writing- is a skill. To keep your reader interested, you should think about structuring your text and writing in an appealing style. You can help your readers to grasp the main idea of your post by providing headings, subheadings and clear paragraphs. If people understand and like your text, they are much more inclined to share, like, tweet and link to your post. And that will increase your rankings! So, in order to improve your ranking in Google, you should definitely try to maximize your writing skills! For some, writing for SEO purposes and writing to attract and keep attracting your audience could appear as two contradictory goals. I totally disagree with this. Indeed, if you not only want a good but also an SEO-friendly blog post, the words you want to be found on should be in a very prominent place. But, using your keywords too often severely damages the readability of your text. So, you definitely shouldn’t do that! Before anything, your blog post just has to be a good piece of writing! A lot of bloggers just begin to write when creating a new blog post. They just type what comes to mind. For some, this may be sufficient, because they are natural writing talents. Others might need some help. I always follow the next set of ‘rules’ myself. Think hard about the message of your text. What do you want to tell your readers? And what’s the purpose of your text? What do you want your readers to do at the end of the page? Write down the answers to these questions before you begin writing. Start your post with creating a clear structure. Every post should have some sort of introduction (in which you introduce your topic), a body (in which the main message is written) and a conclusion (which should summarize the most important ideas or deduce some new idea). Write down what you want to write in all these three sections. You now have a kind of summary of your post. The real writing can begin! Headings structure the entire page, so you should use headings. They’re important for readability, but for SEO as well. Headings help Google to grasp the main topics of a long post and therefore can help in your ranking. If you want people to find their way in your articles, you should use subheadings. Subheadings will lead people, help them scan your page, and clarify the structure of your articles. Make sure you use your keywords in some subheadings. Not in each and everyone of them though, as it will make the text unreadable. Signal words help people to scan through your text and help people to grasp the main idea. Let’s say, for instance, that there are three reasons for people to buy your product. You should use signal words like: ‘first of all’; ‘secondly’ and ‘finally’. Also, words as ‘nevertheless’, ‘surely’ and ‘indeed’ give a clear signal to your readers. Readers will instantly get that a conclusion will follow after words like ‘consequently’, ’so’ or ‘for this reason’. Signal words are therefore very important to structure your text. Make sure your articles have a minimum of 300 words. Google likes long articles, if your article is too long though it might scare away users. So try to stop at around 700 words. And, as a general rule of thumb: try to put your search terms in about 1 to 2 percent of your text. 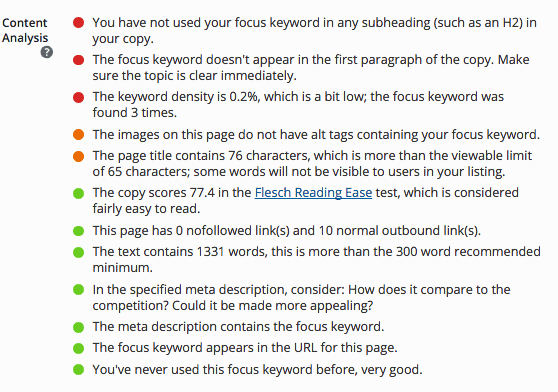 So in an article of 300 words, you should mention your search terms 3 to 6 times. If you already wrote some content about the topic of your current post, don’t forget to link to these posts. It will make your post stronger because you show some authority on the subject. Next to that, your link structure is important for your ranking in Google as well. You should read Joost his post about cornerstone articles if you want to read more about this. 10. Use your Yoast SEO plugin. It checks whether or not you used your keyword in 5 important locations: the article-heading, the title of the page, the URL of the page, the content of the article and the meta-description. The era in which some SEO tricks were sufficient to get your website to rank high in Google has long ended. Nowadays, good content has the highest likelihood to result in a higher positions in Google. And good content also leads to more Facebook likes and shares, tweets and return visitors to your website. Of course, you can do some extra things to maximize the SEO friendliness of your post, but most important is: just write a very, very good post!